In a previous article about gasoline prices I noted that many packaged drinks are quite expensive and the cheapest drink out there is water. The main reason that people don't drink water is that it is tasteless and not very "fun" to drink. On the other hand, water is definitely more healthy than sodas so now there is a entire category of packaged drinks such as VitaminWater that is basically bottled water with coloring,vitamins,and flavor. Instead of buying these drinks, there are many things you can add to water add home to make it more exciting to drink. 1. Salt - I am sure you have heard of the term "electrolytes" in the marketing for energy drinks. Actually electrolytes are just ions that can be found in common table salt. Adding a little bit of salt to water helps your body absorb the liquid more quickly. As long as you don't go overboard with the salt the water should be very quenching and it would be great for workouts since the body loses salt through sweat. 2. Ginger - If you like spices, ginger is a great way to add a "zing" to your water. If it is added to boiling water it is also a great way to clear your throat and sinuses during a cold. 3. Citrus - My husband's family members often freeze a small citrus fruit called kalamansi in ice cube trays and then put the ice cubes in water for flavor. The same can be done with other citrus fruits and the water produced would be infused with vitamin C.
4. Herbs - Mint, lemongrass, and parsley are great for adding aroma and a hint of green to your water. If you want to release the flavor you can crush the plants a little bit before putting them into your water. 5. Cucumber - I saw this at a spa I went to in Hawaii. A water dispenser was half filled up with cucumber slices, and the water dispensed tasted very refreshing and smelled a bit like cucumber. 6. Wine - A favorite of mine to add to water is plum wine or umeshu. It is a very sweet Japanese liquere made from green plums so I drink it with a lot of water. The distinct sweet flavor still comes through when there is one part umeshu in ten parts water. I am sure the same can be done with other syrupy liqueres. 7. Berries - Blueberries and strawberries have distinct flavors that could be soaked up by water. All you have to do is cut or crush a few of the berries into your water. 8. Vinegar - Adding vinegar to water is similar to adding citrus. You will get sour water that has vitamin C. When I was a kid I liked adding apple vinegar to water and then drinking it. I do not recommend mixing in balsamic vinegar since it has oil, but any clear vinegar is good for flavoring your water. Of course any of these things could also be added to soda water if you want to make your own lightly flavored soda. The possibilities are really endless since you can mix and match the ingredients any way you want. What do you think? Do you prefer flavored waters over plain tap? What do you do to make your water more palatable? I'm currently on a anti-candida diet and so am drinking water until it bores me to death. I'd completely forgotten all the things I can do to flavour it up a bit. When I worked in a Lebanese restaurant in university we would serve Iced Mint Tea which was normal mint tea (without sugar) chilled. It's one of the most refreshing drinks I've ever had (plus it's great with a little bit of vodka and lime). I also love to walk, 2 or 3 hours doing about 10-15km. By the time I'm back I'm dying for a drink, but water never satisfies. I find that a splash of red wine in a glass of sparkling water always brings my energy level back up without making me feel heavy and without being sweet. All of my children grew up drinking and liking simple, unsweetened hibiscus (Red Zinger) tea. It's easy to make, just put four bags in a pitcher for a few hours, also very quenching and much more satisfying than water, to me. Awesome post. I used to a lot of money on bottle waters until we bought a water filter-- the kind you keep in the fridge. Even then, it wasn't for weeks after that I realised my problem was that I didn't care for water unless it was *cold*. That said, cucumber water is a recent favourite, especially on hot summer days. Cubed honeydew melon with cucumber makes a slightly sweeter, but just as lovely infusion. I also never drink orange juice without adding a flavored seltzer (usually lime, though cherry also tastes surprisingly good) - instant soft drink, no added sugar. Love it! My favorite flavoring is TEA (with milk and sugar, which is kinda cheating)! But I drink a lot of regular water. There's a Celestial Seasonings tea (black berry or raspberry, maybe?) that you can just toss two bags in a jug of water and toss that in the fridge (not literally, people, it might break) and it makes it taste like fruit punch. Also, if you boil water and smash some ginger root, and here it gets not quite so healthy - but still better than sugary drinks, add some sugar and then pour the water over that you have a pretty tasty ginger tea. Other than that I do lemon wedges, lime wedges, orange wedges. I am a big water drinker and have been since having a few very painful kidney stones some years back. Medical research has shown that drinking real lemonade can drastically reduce your chance of having reoccurring kidney stones. Anyway, I love to a lemon, squeeze the juice into a measuring cup, add 2 teaspoons of Splenda (actually I use the generic versions), add a little water from a bottle of water, stir it and pour it back into the bottle. Shake, Shake, Shake and you have your own personal real lemonade. My wife also grows herbs, and I like adding a few mint leaves to bottled water as well. Splenda in the long run is much worse for you than sugar.Keep in mind that natural products are always absorbed by your body better,and splenda is fully manmade while sugar has only been processed. Anything with no added sugar or zero calories is terrible for your body and hasn't been in use for long enough for people to understand it's full consequences. Even decaffeinated coffee has a negative effect on your body because of the chemical process they use to remove the caffeine. The more natural you are the better, and if we're not careful it will become impossible to find foods that don't contain artificial sweeteners. Aspartame has been proven to cause holes in the brains of mice even in miniscule amounts! Also keep in mind that dieticians (trained medical doctors in the field of consumption) eat butter instead of margarine and put sugar in their coffee. Try a small drizzle of vintage balsamic vinegar in sparkling water. The good stuff is syrupy and expensive, but you don't need much to flavor water. It's also excellent over vanilla ice cream. Really! A very quick and cheap method I use to make water more interesting is to add 3-4 drips of lime or lemon juice. Adds no calories or carbohydrates, tastes nice (but subtle), and I've also heard it's good for your breath. As a college kid, I'm usually too lazy/broke to go for fresh fruits to add. I tend to toss a lemon zinger tea bag into a gallon pitcher and reuse it throughout the rest of the day. Makes for a zingy lemoney quick and easy change to water that keeps me away from soda. I'm sorry, but the vinegar one just sounds disgusting. It'd be like drinking weak floor cleaner. Salt doesn't sound that great either. Salt water (even to gargle on a sore throat) makes me vomit. The others don't sound so bad though. Dissolve brown sugar and ginger in vinegar by shaking or stirring. Add 1 quart of cold water, mix and serve. I make it this up and then dilute it further, so there's just a tang left. Yum. Just made up your recipe. Little House on the Prairie books were my absolute favourites when growing up! Great post. Having been called "The Water Nazi" more times than I care to count, I'm quite a proponent of increasing water consumption. I'm also a natural health expert, and my primary concern for these types of lists is the "health factor" of them. I'm happy to give yours a very high mark. There are two mistakes in this article: Regular vinegar does not contain vitamin C. Balsamic vinegar doesn't contain any oil. I tend to buy the flavored waters (which I find too sweet tasting) and add at least an equal amount of water, cutting the cost by half, but I think the RealLemon, cucumber, and tea bag options sound interesting. I keep crystallized lemon packets in my desk at the office for flavoring water - it's good stuff, made by TrueLemon. It also comes in orange and lime. A packet or two adds a subtle citrus taste. Since when does WATER taste bad!? Sadly, I have always disliked the taste of water. Despite the view of many lucky people, water DOES have a taste. I think it may be the minerals that I taste, because it tastes sorta metallic. Also, I taste chemicals in tap water. It's terrible. I wish I liked water. It's so healthy for you. I hate having to add anything into it to make it taste okay. I've even had ice cold water shooting straight out of the ground and didn't like the taste; although it was much better than tap. Interestingly enough, I like our town's tap water (cold), but I hate bottled water. To me, it has a really bitter aftertaste. A great way to infuse hot liquids is to purchase a French press (less than $20). You can use it for coffee, but I usually use mine to make flavored teas and infusions instead. This way you don't have to worry about straining the brew or fishing anything out of it later (particulary good for small spices, like cloves). For ginger tea I use about 1/2 in of peeled ginger, a couple of cloves, a small piece of cinnamon stick, and a couple of slices of citrus fruit. Let it steep for 5 minutes, then either have it hot or chill it (in the convenient French press). You can add honey if you like as well. Great for when you're feeling a little under the weather, or if you want something really refreshing during the summer. You can also then freeze this mixture (better with honey), or any other infusion you'd like, and make your own 'tea sorbet'. Just freeze it until it's mostly solid, then throw some chunks in the blender or food processor. It's extremely refreshing when the temps are reaching 90-100 degrees! I often add frozen berries to water. A lot of times they're cheaper than fresh, and they cool the water down too! Vinegar is a very healthy way to flavor water (I definitely like the apple cider vinegar best. Numerous studies show that it's great for controlling blood sugar levels, as it slows gastric emptying and decreases blood sugar and insulin levels for an entire hour after consumption (they think it's the acetic acid). Great tips! I'm going to start growing mint and lemongrass to put in my water! I've seen the plants in stores but didn't know what I'd do with them. Now I know, thank you! Fantastic list! I really enjoy citrus in water as well. I drink way to much soda, and this is a good alternative to help keep the body hydrated. Its always best to filter your water first. Take out those nasty chemicals. Then I love my lemon water - just a few squeezes. Yummy. Then I also ad this european cherry syrup - mmmmmmm good. But straight up water is always clear, cold and satisfying. The taste of plain _tap_ water is not appealing. However, the taste of filtered water is good. At least to me. Lately I've been drinking Penta water, even though it is expensive. Sometimes I dilute it half-and-half with tap water, to save money. I started drinking Penta water partly because of the hearsay that Aquafina and Dasani, et al, just take regular tap water and bottle it. The other water that tastes good to me is Ozarka _distilled_ water. So those two seem to be more pure (Ozarka distilled & Penta) and taste better, to me. I'm writing in answer to the person who asked "Since when does water taste bad?" I am sitting here next to a bottle of cold water and have not tasted it yet...oye, it doesn't even taste bad! It is just not as good as soda...and I need just some fresh water. I like the ginger idea. We drink tons of filtered (Brita) water. We have generic soda (seltzer) water on hand when we want something different, and often add splash of that to juice or wine. For water the only things we have tried is lemons, limes, small splash of berry juice, also make "sun tea". Just made up a batch of Ginger Water! I enjoy water with a few peppermint or spearmint leaves. Perhaps ten to a dozen works for a gallon of water; just let them soak for about an hour, and it's ready to go. For longer bicycle rides, I put about a shot of apple cider vinegar in my Camelbak (about a liter or so in capacity), and it helps keep my mouth hydrated as I bike. My friend just told me of something that really turned out great...try orange slices and star fruit slices. Let it sit over night in the fridge. I tried it and really liked it!! Boil your water then cover the pot with a kitchen towel to keep bugs out and let it sit overnight. I recently started trying to be more healthy while not spending too much money. I hate to buy bottled water and filter my tap water now, but it does get boring. I can't wait to try some of your ideas! Maybe now I won't find it so hard to get the recommended amount of water each day! I have the water problem too, omg, I hate tap its so gross. Everyone says I'm crazy that I can taste water...wtf? I do sometimes drink bottled water its much better than tap, but boring. I like to use off brand raspberry crystal lite which I buy at walmart. That helps a little, but I'm totally addicted to soymilk. I don't know if it is as hydrating or whatever, but it is much healthier than sodas and tea I've heard dehydrates you worse... which is sad because sometimes that's the only way I want water, sweet tea, but adding sugar is probably just as bad as the soda. I sound like a teenage idiot, but I really do wanna be healthier and more hydrated mostly, because it seems I'm never ever thirsty and when I am water tastes horrible. I get kidney stones, they feel like u are dieing. Seriously and my doc says lay off the soda and I can't I want to find a way to actually like water enough to where I drink a healthy amount of it. I will try some of this stuff. Water doesn't have to be cold, add citrus to hot water and it's lovely in the mornings. Another favourite of mine is carbonated water, I started drinking it when I lived in Germany for a bit back in 2007 and I find it very refreshing and again, you can literally add anything to make it interesting. Definitely better than sugary fizzy drinks and quenches my thirst much better when I'm eating than still water. I can taste the difference between types of water too, I believe it is due to different mineral contents. I'd just like to note, to the people here saying "I drink 8 glasses of water a day, I'm healthy! ", well you only need eight glasses total of water per day regardless of the source. You get most of your water consumption through food or non-water beverages anyways (beverages are mostly water to begin with, and so are many foods). You don't need to drink 8 glasses of water a day, which can cause you to visit the washroom more times then needed, you just need eight glasses of water total, including from your other drinks and foods. You could typically never drink a glass of plain water and still be 100% healthy. That being said, I still drink water, mostly because I'm a student and I frequently run out of funds to buy as much milk as I normally drink (I love milk!) so most days I drink a few glasses of water. 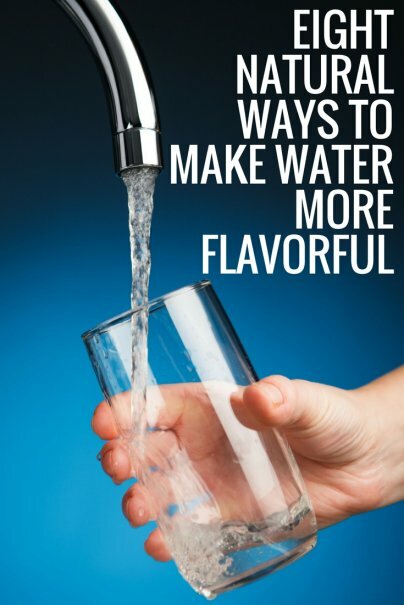 I hate the taste though, and I always look for ways to flavour my water, I will have to try the methods listed here! I beg to differ. If I "only" drank 8 glasses of water a day, I would be chronically dehydrated. I average 3-4L of plain water a day in winter, usually twice that in summer. I live in a VERY dry climate, one my body's still adjusting to after almost 20 years in the subtropics. I eat very little salty/sweet foods (by this I mean ones with added salt and sugar), only eat a moderate amount of protein, and don't drink coffee, soft drink or tea, so it's not like the extra water is to make up for an entire packet of beef jerky or whatever. A person's water requirement has nothing to do with a magic number and EVERYTHING to do with what else they're eating/drinking. Drinking water is one of the few ways our bodies can keep the solute balance in our cells within a healthy range. Most people in modern society are chronically dehydrated. Try drinking at least 2L of water a day for a month and tell me you don't feel better at the end of it. You get about 20% of your water intake from food and 80% from beverages. youare correct that water is just one of the choices for water. There really aren't any firm guidelines on the amount of water everyone should drink. It varies from person to person and a registered dietician can determine what is best for a person. With that said I still a firm beliver that drinking plenty (whatever that might be) of a water is a good thing. I've heard of people using the "urine method" to determine if they are drinking enough fluids - if the urine is very pale then you are drinking enough. Not sure how scientific or accuate that really is, but it does keep you very connected to what is going inand coming out of the body! I read this article and decided to try the Ginger. After boiling and getting a good concentrate, I mixed it with tap water and put it in the freezer until it was half frozen. It works great! It's slightly spicy, so it helps me stay up while studying. do vegetables in water go bad? and if so, how long? I hate my tap water it taste nasty and buying bottled water gets expensive so I get some empty 2 liter soda pop bottles and add a tiny bit of salt and sugar then a tiny bit of lemon. I shake it up for awhile then chill it in the freezer for a few minutes till you see ice starting to form take out put in fridge overnight really good the next day.